Few educational hobbies provide as much universal fun as star-gazing. It’s an activity that kids and their families can get pleasure from together, and can be expanded as proficiency and skill increase. Also, it doesn’t require a lot of equipment to begin. All you need is a suitable pair of binoculars. Many parents don’t realize that, like telescopes, binoculars work well to find and study things like nebulae, star clusters, comets and even distant galaxies. Some are surprised to learn that binoculars offer some definite benefits over the classic telescope, especially for children. Binoculars are lighter than telescopes and don’t need to be set up. Just throw the binocular strap around your neck when the moods strikes, and go look at the stars. Binoculars are also made with unique prisms that permit the viewer to see the moon and other heavenly objects right side up, instead of upside down the way most telescopes do. Binoculars have a wide field of vision, making it easier to see more of the sky. If you happen across a comet or a large constellation, the extra view makes it easier to see and follow them. Binoculars also have two lenses, which is easier for younger eyes to see through, and both smaller and lighter than a telescope, so kids can handle them more easily. One of the biggest benefits to families on a budget is that binoculars are less expensive to than telescopes. Plus, they provide great opportunities for your children to participate in animal or bird watching, as well as using them when viewing sporting events or musical theater. When buying a pair of binoculars for star-gazing, there are a few important features to consider. Aperture: The diameter of the front lenses. They should be large enough to pick up the dim night-time light given off by the stars. Look for binoculars with no less than a 40 mm (millimeter) aperture. You can locate the aperture of a pair of binoculars by analyzing its number pairs. A 7X35 has an aperture of 35 mm while a 10x50 has an aperture of 50mm. Magnification: As the word says, this measurement describes how close the object appears to be and is shown by the first number in the number pair. Binoculars for astronomy must have a magnification of between 7 (7x35) and 10 (10x50). Anything higher produces a fuzzy image and would require a tripod. Exit Pupil: Like the pupil in ones eye adjusts to the darkness of our surroundings, so binoculars can adjust how much light hits the user’s eye. As we age, our pupils lose the capacity to dilate easily as they did when we were younger. When binoculars allow more incoming light then our pupils can deal with, the view will be dimmer than it should be. The exit pupil measurement is found by dividing the aperture by the magnification. For young people and those in their mid thirties an exit pupil number of 6 or 7 will work best. For parents in their forties and older, an exit pupil number of 5 or 6 will allow for a brighter image. Do all these numbers sound confusing? Don’t worry. If you choose a good astronomy or sporting goods store, their employees should be well trained in each model and brand of binocular they sell, and can help you find the binoculars that are right for you. The very highest quality binoculars tend to be a little heavy for comfortable viewing. But that doesn’t have to be a problem. Field Optical Research carries several tripods and accessories that allow you to enjoy the benefits of the larger binoculars without undue stress. While you’re shopping, you might consider a pair of eyeShields. EyeShields are made of soft pliable plastic and attach to the binocular eye-pieces to provide a more comfortable viewing experience while cutting eye irritants like wind and glare. They allow for better focus and improve night vision and increased comfort for both you and your children. In this age of technical and digital entertainment, turn off the electronics and take your family outdoors. 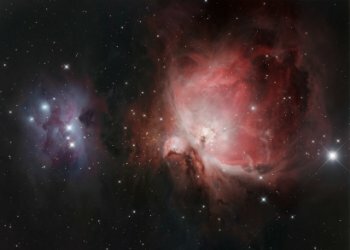 Explore the constellations in Orion’s belt, gaze at shadows in the moon’s craters, or get a close-up view of the Milky Way. Create lasting memories as you introduce your children to the wonders of the universe.